'Silent, invisible' malnutrition seen as threat to generations in Congo - SABC News - Breaking news, special reports, world, business, sport coverage of all South African current events. Africa's news leader. Starving children are the glaring face of Congo’s humanitarian crisis, but millions more people are suffering slow onset malnutrition which could have harmful effects for generations, the United Nations said on Thursday. About 13 million of the Democratic Republic of Congo’s 80 million people are in need of humanitarian aid – 50 percent more than last year – since fighting in the central Kasai region and other areas forced millions to flee their homes. Although violence has subsided in Kasai, fields are still barren and many people have not received food aid due to lack of funding, the United Nations and aid agencies said ahead of a donor conference in Geneva on Friday. Congo’s government has shunned the upcoming aid conference, saying that humanitarian actors are exaggerating the level of need, which will discourage investment. “The problem with chronic malnutrition is that you don’t really see it. It is silent and invisible,” said Alexis Bonte, country representative of the U.N. Food and Agriculture Organization (FAO). 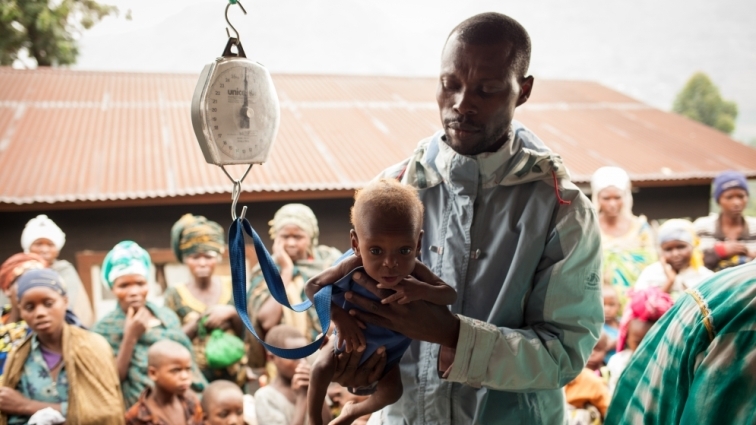 Between 60 and 70 percent of people in Kasai and Congo’s other conflict zones have chronic malnutrition, which stunts children’s physical and mental development and makes them less likely to attain better opportunities as adults, he said. Aid agencies are racing to help the 10 to 15 percent of people who need food urgently to survive, but those suffering a long-term lack of nutrients are harder to assist, Bonte said. “That is one that we cannot handle by ourselves because we don’t have the money and we don’t have the capacity,” he told the Thomson Reuters Foundation by phone after visiting Kasai. People are starting to re-plant fields, he said, but it will take one to two years to regain normal crop production. Last year assistance reached only a third of people in need in the massive Central African country as funding fell short, said the United Nations which is seeking to raise four times as much this year – $1.7 billion. British charity Oxfam said it was forced to half food rations for 90,000 people last year due to lack of funding, and this year cut back even more. Crises in Kasai and eastern provinces have been aggravated by President Joseph Kabila’s refusal to step down at the end of his elected mandate in 2016 with uncertainty sparking deadly street protests and fears Congo could slide back into civil war. “The stakes are incredibly high in DR Congo. Continued inaction would be measured in loss of civilian lives,” said Jan Egeland of the Norwegian Refugee Council. This entry was posted on 12 Apr 2018,08:07PM at 8:07 PM and is filed under Africa, News, Homepage Latest Stories Slider. You can follow any responses to this entry through the RSS 2.0 feed. Both comments and pings are currently closed.